The Chicago Tribune has taken a big step closer to unionizing for the first time in the paper's 170-year history. 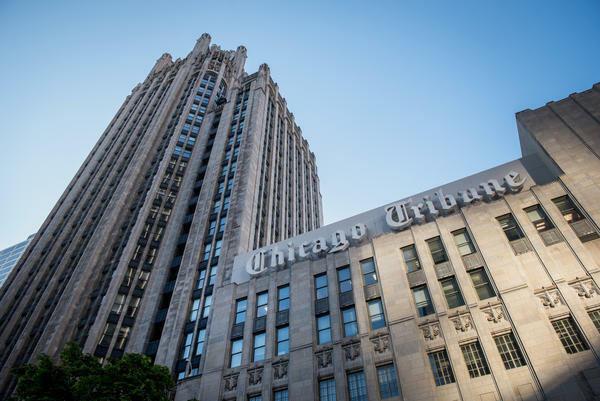 The Tribune's owner Tronc has agreed to negotiate with a union representing the journalists from the paper and affiliated local publications. NPR's David Folkenflik was the first to report this development and has the update. DAVID FOLKENFLIK, BYLINE: The first thing to remember is how hard Tronc fight against an earlier unionization drive at the Tribune's sister paper the Los Angeles Times. Tronc lost in a lopsided vote in January. The second thing is that the Tribune and the LA Times both boast strong anti-union traditions - both on their editorial pages and in their boardrooms - and yet the decision in Chicago represents the second big win for a Tronc newsroom union in just four months. Tronc struck a deal to sell the LA Times just weeks after its newsroom vote. The completion of that deal is believed to be imminent. In this case, Tronc officials yielded to the logic and the math of the moment. As organizers of the Chicago News Guild's efforts said, they had the support of more than 85 percent of the 280 journalists they intend to represent. Tronc recognized three bargaining units - the first for the Tribune and its entertainment-oriented tabloid RedEye, the second for papers in suburban Chicago and the Spanish-language newspaper Hoy and the third for a growing centralized team of staffers who perform editorial production jobs for newsrooms in Chicago and beyond. Tribune journalists hailed the decision as a great coup - cutting short the recognition process that would have been overseen by federal regulators - while Tronc said it looked forward to working productively with the union. David Folkenflik, NPR News.